And everything was Detarou and nothing hurt. Deru Game, the latest surreal escape game from the maestro of... whatever this is... serves up another dose of the bizarre, the mildly unsettling, and the just plain freaky. Click around to find clues, but more often, just find more puzzles as you explore and look for a way out, using the bars at the edge of the screen to navigate and a changing cursor to interact. As usual, solving Detarou's puzzles involves figuring out the relationship between what you're looking at and the clues in the room... as well as deciphering the clues to begin with, since most of them are rarely as straightforward as they first appear. Detarou has a knack for multi-layered puzzle solutions, and often the game's very weirdness tends to act as a red herring that makes you overthink a solution that's staring you in the face. It's the sort of experience that leaves you feeling particularly clever whenever you make progress, but can also be more frustrating than usual when you get stuck. The complete lack of feedback when you're trying and failing to figure things out or use items means it's easy to hit a wall... but, then again, that's sort of what you come to these games for, right? Like other Detarou titles, Deru Game will lead you in circles, referring back to people and things, and you'll need to examine items in your inventory for even more clues in order to proceed. It actually feels a bit less, well, creepy than Detarou's games have had in the past, with a greater emphasis on clever puzzles than shock value... though there's still a lot to raise an eyebrow over. Deru Game is still weird, but definitely not quite Detarou's weirdest, and packed with puzzles and cryptic clues, it's a fine way to spend your day... even if it may still lead to some awkward explanations if someone catches a glimpse of the screen over your shoulder as they walk by. Game not loading? Try this alternate link. Deru Game Walkthrough now available! When you begin, you're facing a poster of a girl holding a ninja star in her mouth. Back up from the poster. Inside the hutch, on the bottom shelf, there is a white flower and a box with four square buttons around a round crescent moon button in the middle. The doors to the cabinet are locked and need some sort of key. Zoom in to the couch and click the guy rubbing his gut. He'll levitate so you can see the clue behind him. Make a note of it. Then look above the couch, at the clock. Open the clockface to see four buttons in the back panel. Clicking them will change the colors on the corresponding circles. You'll need a clue to determine the correct four colors. Go through the blue door. Here you see four men in neckties, a red flower on a square cabinet, and a round panel in the wall. Note not only what designs are on the top of each man's head, but the order in which they bow to you. Also note the color ties they're wearing. Leave the blue door room and go right. Here you see a green door. The green door needs a 5-digit number to be unlocked. We'll need more clues before it can be opened. 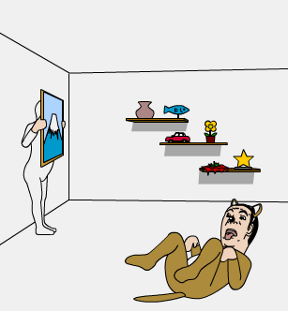 Take another right and you'll see a man acting like a door, three shelves on the wall, and a man holding a mountain painting. Examine the items on the shelf, noting what you see. Clicking the corners of the mountain painting will make it wobble...so there may be a sequence to be discovered elsewhere. Turning right again, you'll see a red door (locked) and another right turn takes you to a locked yellow door (a key card is needed). On the wall is the image of a robot and a series of arrows. Note what you see. Go right two more times to the couch scene. You're ready to solve some puzzles. Zoom in on the clock above the couch and open the front panel. Click the buttons to change each circle to the proper color, then click the rectangular button below to open up the back panel. The answer is on the heads and tied around the necks of the four men in the blue door room as well as written on the couch back...shapes on the couch give order, ties give color. When you get the back panel open, take the KEY. Use the KEY to unlock the cabinet doors. Slide open the right side and take the COMPUTER TOWER. Open the top of the computer to get a KEY CARD. Turn around until you're facing the yellow door. After using the KEY CARD to unlock the yellow door, go inside. On the wall to the right is another round panel with a slot for something square to fit inside. In the middle of the wall is a glass-incased niche with spot for a wooden doll. A model of a blue mountain is surrounded by four shapes. Take in that information then back up. The glass top of the case could probably be removed if you had a screwdriver, but you'll need to save that for later. Leave the yellow door room and go back to the man holding the mountain painting. Click the corners of the painting in the correct order to reveal a surpise. When the painting's wobbled properly, the man's head pops through and you can take a KEY from his mouth. Back up and turn right to the red door. Use the KEY from the mountain painting to unlock the red door. Go inside. Here you see a TV, another round panel in the middle of the wall, a robot, and something written on the floor. While a bit of a pixel hunt, you should be able to find a power button to the TV in the upper left corner. Turn on the TV and note the clues. Possibly a clue for the box in the main room, it's a series of numbers followed by a crescent moon. The robot man appears to be asleep, so there's nothing we can do with him now. Leave the red room and go back to the hutch/cabinet next to the couch in the main room. Press the square buttons in the correct order then press the crescent button in the center to open this box. The clue on the yellow room's floor refers time...12 o'clock, 6 o'clock, etc.. Match those positions on the clock to the buttons on the box and press the buttons in that order. After getting the TV REMOTE, turn back to the red door and go inside. Pull the robot man's ears in the correct sequence. When done properly, you'll..um...receive the SCREWDRIVER. Use the SCREWDRIVER to remove the glass top. There's still a small matter of the green door before you can progress any further. Go inside the red door. If you haven't already, hunt for the power button on the TV (upper left corner) and click it. Blue+White. Red-Blue. Yellow. Blue-Yellow. Red. It's the flowers. There is a white flower on the hutch by the couch, a yellow flower on the shelves by the dog man, a blue flower by the yellow door, and a red flower in the blue door room. After you've followed the steps above, you have your answer. Return to the green door, zoom in on its lock panel and enter the code. Use the number of petals on the colored flowers with the clue on the TV when you press its hidden power button (NOT the remote). After you've opened it (see previous spoiler)...Go inside the green door room. A four-letter code is needed to free kitty cat. When you get the case opened, take DANCE KITTY. Go back through the yellow door and put the kitty on the mountain. Tap kitty and kitty will hit the mountain, sending the wooden WORM DOLL out of the mountain. Take it. Place the WORM DOLL on the indentation below the glass. The glass will slide down and you can take the BLACK CUBE. Now use this black cube in each of the four rooms, including this one. After gaining the BLACK CUBE, with the help of dancing kitty, place it in the round panel in the walls of each room. As you note the information that is revealed when the cube is in each round wall panel, also play attention to which door you're inside. Put the cube in the wall panel, note the red spade, then take back the BLACK CUBE. Taking the black cube, use it in the blue room, red room, then finish in the green room to get three more clues. After getting the last black cube clue in the green room, go through the black door. Ignore the pandas for now (they're up to no good). Go over to the computer desk and hook up the COMPUTER TOWER to the moniter. Look at the moniter and solve this final puzzle. You need to enter the correct sequence of shapes as well as the correct color for each. The tricky part is putting together several different clues that cross-over to other puzzles. Note the colors of the doors on the KEY CARD. Each clue you gathered is affected by which door it was found inside. When correct, click the large rectangle at the bottom of the screen; the moniter will flip open and you can take the GOLD HANDLE. Back out several times and turn left to the blue door. Go inside. Use the GOLD HANDLE on the cabinet under the flower. At any time after you've opened the green door, if you'd like to end the game early with the "Bad Pandas", then just go through the black door. Save your game so you won't lose progress. First Button: panda man is propelled into the ceiling. Second: big panda is sent up. Third: you fall through a trap door. *fingers pointing* Haw Haw. Fourth: both panda man and big panda are sent upwards. To activate the red stamp puzzle, you must first use the GOLD KEY to unlock the exit door. Open it, but don't walk out. Go back into the red room and look at the TV. You should see a new clue. But, if it's not there, make sure you've used the power button on the back of the TV. When done properly, he...gives...the RED STAMP. Pick it up. With the RED STAMP in your possession, head out the front door for the perfect end. I can't stop hitting the flowerpot guy. Out without a walkthrough! But I must admit this is the first Detarou in a while to have me completely stumped a few times. Plus I made getting the stamp so much more complicated than it was. Disappointingly it's also the first Detarou in a while that didn't leave me slightly disturbed. Seek counselling! Ha, like I'm one to talk, I ended up getting 500 coins from flowerpot guy. TV had a power button. Other than that, easy escape. Find the flowerpots in all Deru Game room, note the petals, something is strange, neh? I've unlocked all the doors except for the white one. I've also used the box thingy with the computer, but have no idea about the code on it. The only item left in my inventory is the card, and I don't know what the door code on it means. I saw the code for the man-in-the-box in the wall, but when I try clicking on the man's head, nothing happens. Am I supposed to use something with the man before I can click on his ears? I also saw the string of numbers for the crescent moon box, but don't know how they match up with the buttons. The crescent moon box is the thing you should focus on at the moment; the rest will unravel from there. The clue will make sense if you match it with something else. Something in the main room. Something with numbers on it. Not every number in the clue is a single digit number. ...once you figure that out, you'll know what to do with the boxy-man. ...Turn the TV off and then back on? Thanks for the help, guys! Out and with the red stamp too. I'm stuck like Shudog. I've explored as far as I can but I don't have *any* items. i'm stuck on the moon box. help? @Ashiel: Yeah, that's what I'm puzzling out, but I'm having a hard time figuring out what to apply them to. I posted the first part of my walkthrough for you, Ray9na. The answers you need to get started should be in there. POP. I figured out the kitty. He's jealous that something else has his face. The item you get as a result will help you figure out the rest. And I figured out the thing in the panda room. Cat gets worm gets thing. Follow the order on the card. Why yes, that was insanely cryptic. Also, I apologize for the unspoilered comment above. Even if it's not necessary, it's inconsistent of me. turning the TV off and on again, but the display has not changed. Open, but enter not, the door. Der. looking down at the mountain from the top. My one beef with Detarou is that overlap of clues... you end up brute-forcing *anyway*, which removes the cleverness. getting the red stamp, and even then I had it narrowed down to two possibilities. Look at the clock again. but I still enjoyed it. I did need the hint for the tv, otherwise I was able to complete the game with the stamp on my own.